The Water Adventure park at Wallington, Mini Golf, Amaze’n Games in Wallington, local boutique breweries, lunch and a steam train ride in nearby Queenscliff, the Fort at Queenscliff, Van Loons Plant Nursery and Café, or visit Lorne via the Australian National Heritage listed Great Ocean Road only 1 hours drive. 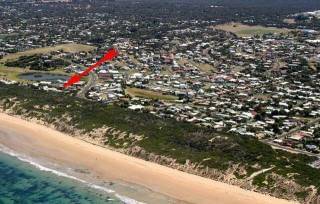 After Dune Delight is conveniently located between the Ocean Grove Marketplace and the Terrace shopping centres. 15-20 minute drive to Queenscliffe, Pt. 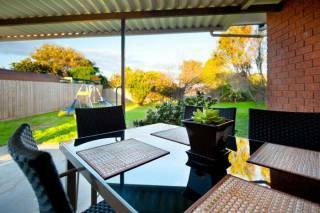 Lonsdale, Geelong, Portarlington, St. Leonards and Torquay, a great location to explore the Bellarine Peninsula. 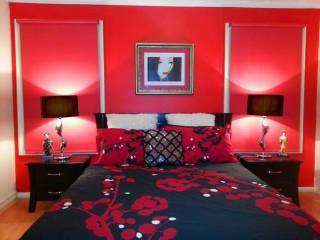 After Dune Delight has 4 good sized bedrooms, main with queen bed, 2nd with queen bed, 3rd with queen bed and 4th complete with 2 sets of bunks (4 persons), the bedrooms are supported by 2 bathrooms including ensuite with feature bath, 2 showers and 2 toilets. The large open plan kitchen, dining and living area includes tv, dvd, stereo, ipod doc station and incorporates many extras including split system reverse cycle air conditioners and gas heating, expansive cedar windows and doors, cathedral ceiling and exposed beams lending a rustic charm. The kitchen includes microwave, dishwasher granite bench tops, under bench water filter, and is amply fitted out with elec oven, gas cooktop, quality crockery, cutlery, glasses, platters and appliances to cater for the most enthusiastic cook on holiday!! Complete with laundry and washing machine. Outdoors in the sheltered alfresco area which spills from the meals area, there is bbq, outdoor seating, in fenced, private courtyard area, partly roofed for use all year. This quality Ocean Grove accommodation is ideal for extended family groups or couples to enjoy week-end or extended holiday breaks in comfort and style only 700 metres to the beach, and close to shops, restaurants, cafés, and wineries which offer a variety of foodie options. Park your car when you arrive, put your feet up and enjoy all that “After Dune Delight” has to offer and just relax, or enjoy the location as a base to explore the wonderful treasures the Bellarine Peninsula has to offer.